If you haven't had the opportunity to meet Gossie and her friends, I recommend that you do. Olivier Dunrea has created four goslings (the other one is Ollie; I can't believe I don't own it. We usually read it at the library) who are like little people in the way that they act and play. They all exemplify a toddlerish characteristic, and because of it, get into a bit of trouble. The illustrations are fabulous; they convey emotion so clearly that even though the books' plots are simple, the stories have more depth because of them. 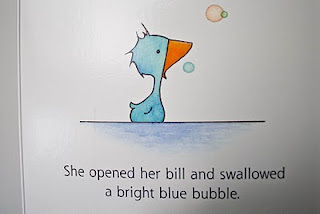 BooBoo loves to eat, until she eats something she's not supposed to (a bubble) and has to figure out how to stop burping. Jackson finds this book beyond hilarious and supplies the sound effects himself. 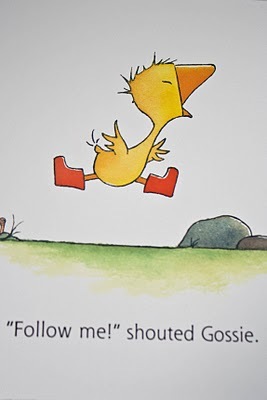 In Gossie and Gertie , Gossie is a bit bossy and likes to tell her friend Gertie (who is a follower) to "Follow me!" But when Gertie starts to make decisions for herself, like whether it is a good idea to follow Gossie into a mud puddle, Gossie gets increasingly angry. Jackson loves watching Gossie's expressions throughout the book, and the way Dunrea has Gossie "saying," then eventually "shouting" makes for fun storytelling for the reader. I wish you could hear Jackson's voice when he says "Follow me!" on this page. It's like he's possessed. It's so funny and worth the price of the book for sure. 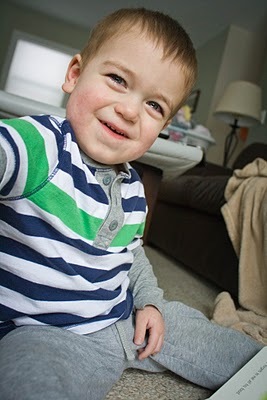 He always turns to me and attacks me with tickles, because he imagines that spiders are very tickley. I caught him in the act this afternoon. His left hand is reaching out with wiggly fingers to get me. Also, as an aside, I think that Dunrea is a secret Red Sox fan. Peedie is a nickname for Sox second baseman Dustin Pedroia, and coincidentally, Peedie wears a red baseball hat. Peedie also does a lot of basebally things in his hat throughout the book: "He wears it when he dives; he wears it when he slides." 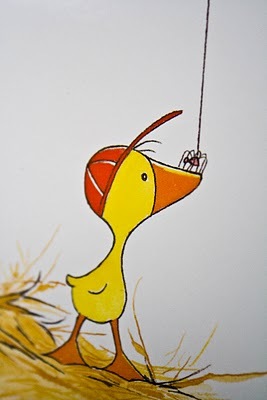 If indeed Peedie is a little homage to Pedroia the Destroyah, it makes me like the book even more. 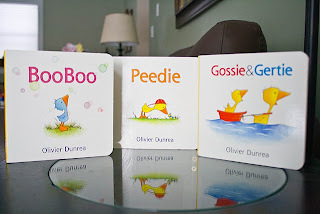 I wish I had Ollie but I don't and haven't read it enough to give you a full report, but that and all the little spinoffs of these books are great (Ollie has a couple, Gossie has one without Gertie, they all have holiday books and lift-the-flap books ). They are inexpensive, durable board books that I think are pleasant to read and teach tiny lessons. And if you like all four, you can buy them in a four-pack for next to nothing. A great shower gift or fun addition to your child's library! And the best part is, I bought most of these at TJ Maxx in West Lebanon for less than half the suggested price! Better head over there and start looking for our four feathered friends!